Moss terrariums as a piece of home decor? Never occurred to me until I read about it in this NY Times article. I was literally drooling over the ones from Twig Terrariums in that article. Those tiny people are oh so cute! On a side note, I have been on the look out for those tiny people since. If you come across any please please let me know. Unlike the terrariums that were popular in the US in the 70’s the new age terrariums come in various forms and in interestingly shaped containers, especially the apothecary jars. 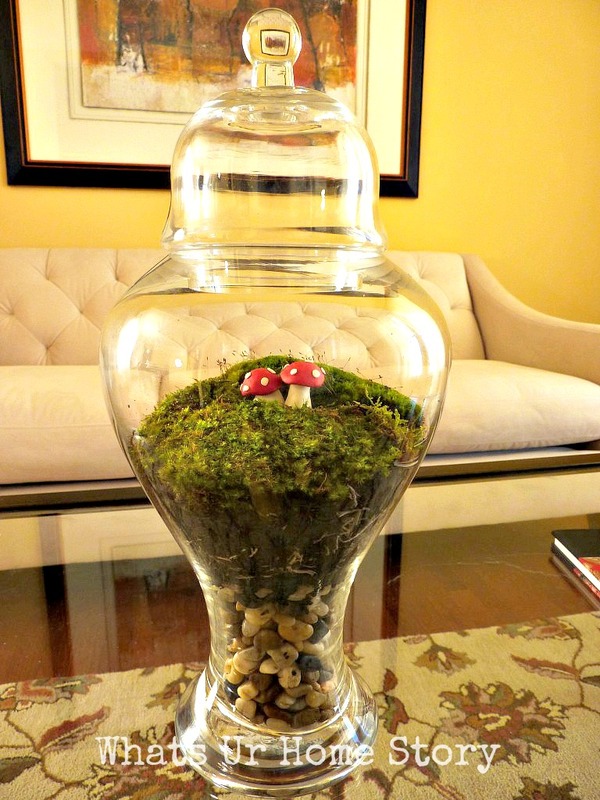 The apothecary jar and the terrarium….a match made in heaven. The earthy feel, the contrast of the moss against the glass, and the endless creative possibilities, I was sold. I wanted to make one. And when did this stroke of a genius idea hit me? Of course, in the dead of the winter. So now where do I get the moss from? For everything odd there is EBay! Hurray! Once I had my materials ready (see below for the list) it took me about say 15 minutes to put it together. It really perks me up to see my little piece of lawn when it is winter wonderland out side. Update -Nowadays fresh moss is available on Amazon. Choose an interesting clear glass jar with a wide opening (so that your hand can go in and out easily). Can be anything, even an empty cookie jar. The more interesting the shape the more eye-catching the piece. Layer 1 – Add your gravel. Any small shiny stones from your yard would work. I was in no mood to dig for stones under 4 inches of snow, so took the easy way out. Layer 2 – Activated Charcoal. Keeps any unwanted odors away. Usually found in the pet supply section at stores or at Amazon. At pet stores check in the reptile section. Layer 3 – Sphagnum Moss. Prevents the potting soil from seeping through to the bottom when wet. For those of you who don’t have access to sphagnum moss a torn up loofah or even coir fiber from inside a coconut husk (where I hail from that is so common) would work. The idea is to not let the soil seep all the way through. Layer 4 – A medium (not too thick) layer of potting soil loosely packed. Layer 5 – Add your moss. You can also use miniature plants instead of moss. I have been planning to make one with succulents next. Layer 6 – Add your decorations. You can just leave it as it is if you like. I made two polymer clay mushrooms using the instructions from this video on YouTube. That looks cool but how do you care for it? Just use a spray bottle once in 2 weeks and keep it away from direct sunlight. If condensation appears just leave the lid open for sometime. Nice idea….luved the jar shape! As always thanks Sunita chechi. Thanks Kala. Thanks for dropping by. Visited your blog. Good work. You should definitely try it. You could use moss from one of your walks outside. Keep me posted for sure. I came across your blog while browing the pics on the Home Goods Customer Finds section. I actually bought a twig terrarium for my desk at work, but will DEFINITELY be making a bigger one for home thanks to your blog. I love your ideas! Thanks for the info! That is so…cool. Does your twig terrarium have those cute people inside? I just love their landscapes, really creative. Yes, you should try making one. Let me know how it goes. Do send in some pics. who knew you were this awesome????? I can;t imagine i sat next to you for so many years in school and i am still clueless as to how to decorate my home uhh…….Boy oh boy. Glad you liked it. Unfortunately I ended up killing the moss too. 🙁 There is a link at the bottom to the update. In which layer did you added the Potting soil? Oops, didn’t realize till now that I didn’t mention that. Have updated the post. The potting soil comes after the Sphagnum Moss. Thanks Shruthi. Awwww I love the little mushrooms! So cute! Thank you for sharing! This turned out so nice! I always have a hard time keeping mine alive, no green thumb here! Thank U! I didn’t have much luck with this one either. My over enthusiastic daughter was spraying the moss with water way too often behind my back. 🙂 By the time I realized this the moss had started to rot from over watering! I’ve been wanting to build a decorative terrarium myself, I’m thinking maybe for Easter! Yours came out really cute!